What do you do during baby’s naps? Clean your home? Cook? Or you are smarter than that and you take a nap also? Workout, make a manicure, read a book, watch your favorite tv-series… I want to say, that most important is to do something for yourself, whatever it is. Well and the most appropriate time for that is when kids are asleep. Yeah, right, but you now that everyday naps start to end one day. And those days I feel like I have lost my moment of free-time. Especially if no-nap isn’t equal to early going to bed and I don’t have much of that free-time in the evening too. Well but I need that and want that. All of moms do. Ha, ha, there are cartoons for that you can say! Of course there is, but I already use cartoon time in the morning to take a normal shower. And cartoons aren’t quiet at all, so cartoon time isn’t quite good for concentrating to work if you are a working from home mom. And there are puzzles! 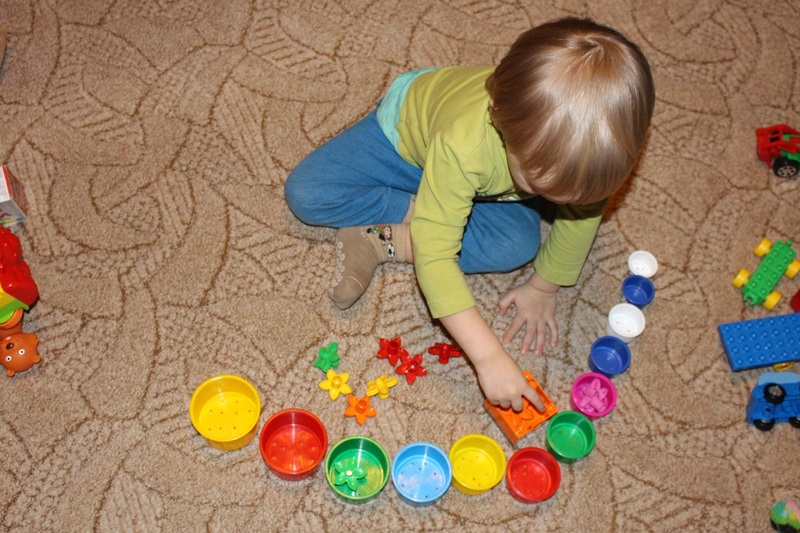 If your kid is interested in puzzles, it is one of the best educating and thrilling quiet activities. But I wanted to write about something else, because sometimes kids get tired of all the toys and puzzles – maybe they are too colorful or too definite… So there is a really good alternative for moms to find time for themselves / do a dish / work / to plan a day, week or trip – so called “quiet activities”, which can hold kids’ attention for at least 15 minutes and which they can do on their own, ideally if learning something during that activity. First time i gave only the basic set and one metal cup and I was happily surprised that Toms kept playing with this activity for more than 1,5 hour. Truly I was hoping for at least 15 minutes, so jay! 🙂 Afterwards I cleaned all up. Second time I added few measuring spoons and more plastic containers. He was interested for 40 minutes while I peacefully made dinner. 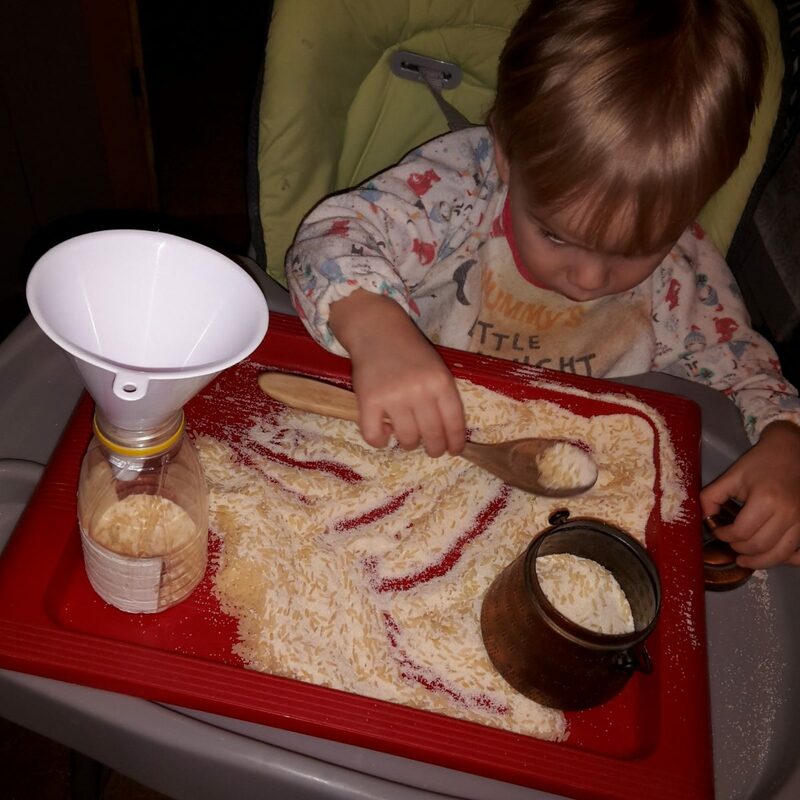 Starting second time I invited my toddler to help put all semolina and rice mix into storage bowl with lid in the end of playing. On third time I gave transparent plastic bottle and funnel. 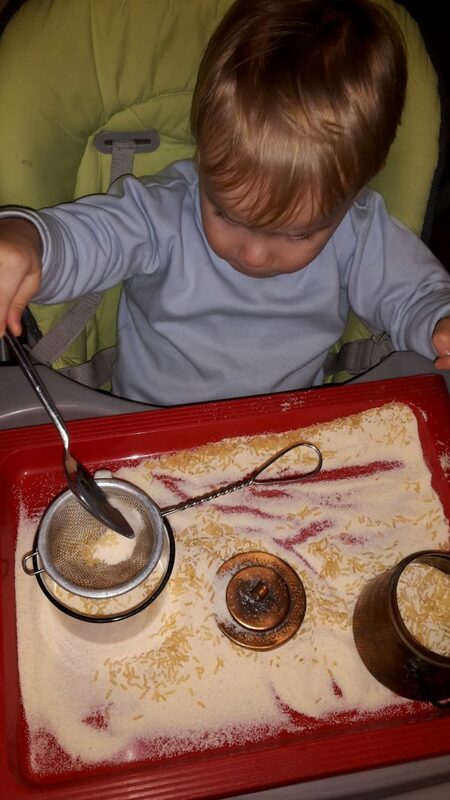 This time he played with small wood spoon, but it was a bit harder. After few minutes Toms gave away strainer, it was enough with a funnel this time and he played for about an hour. 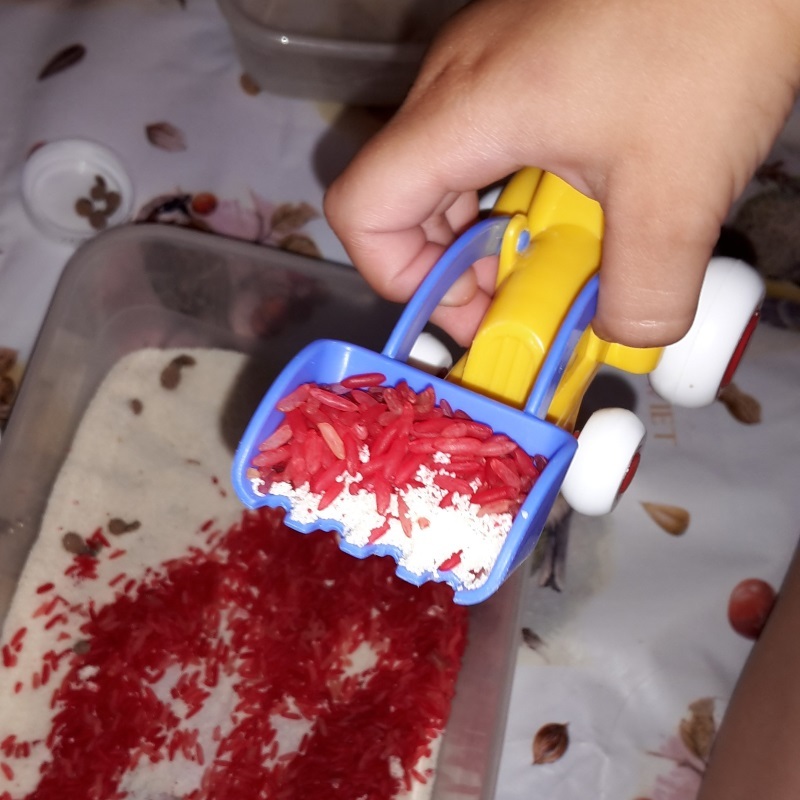 Some time has past and we have painted rice with red food coloring. Just for more fun! And we have bought two of the fantastic Viking Toys work cars – excavator and truck. 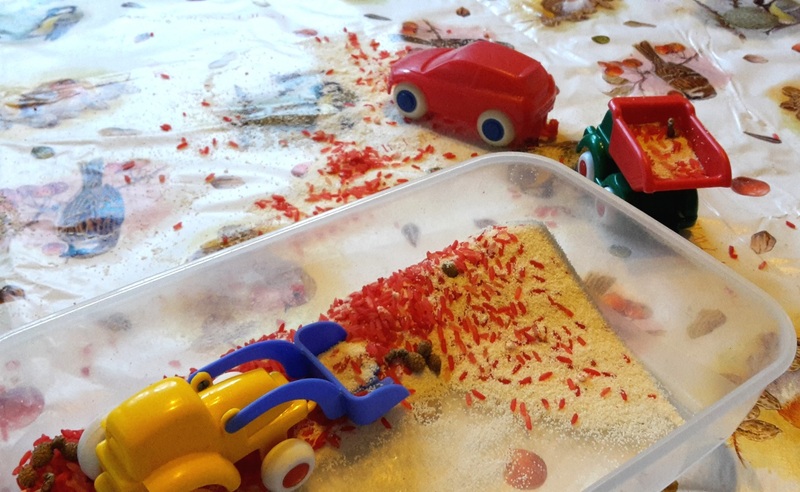 I can suggest their toy cars from all my heart, because, first, they are suitable for very small children, second, they are very durable, but at the same time elastic so kido wouldn’t hurt himself if step on or fell on them, third, they are washable and fully water resistant and lastly they are not expensive! 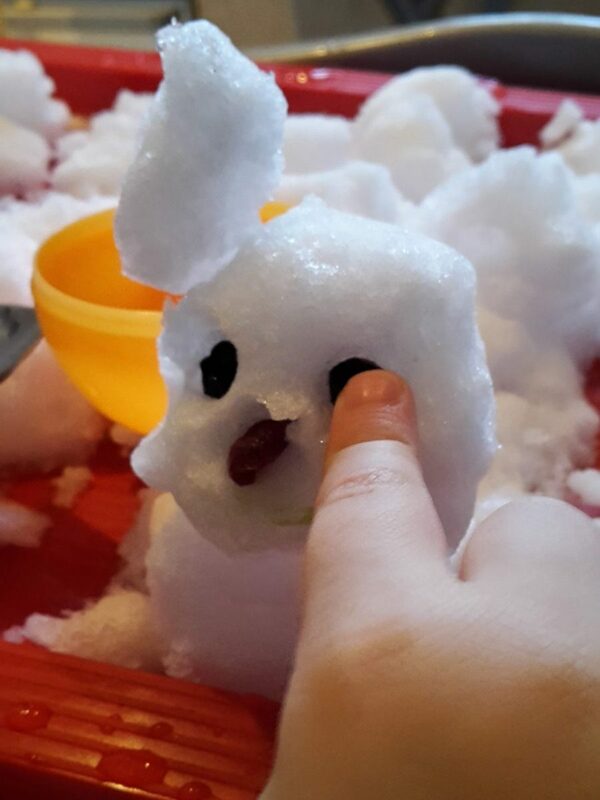 During winter kids can play with snow also indoors. 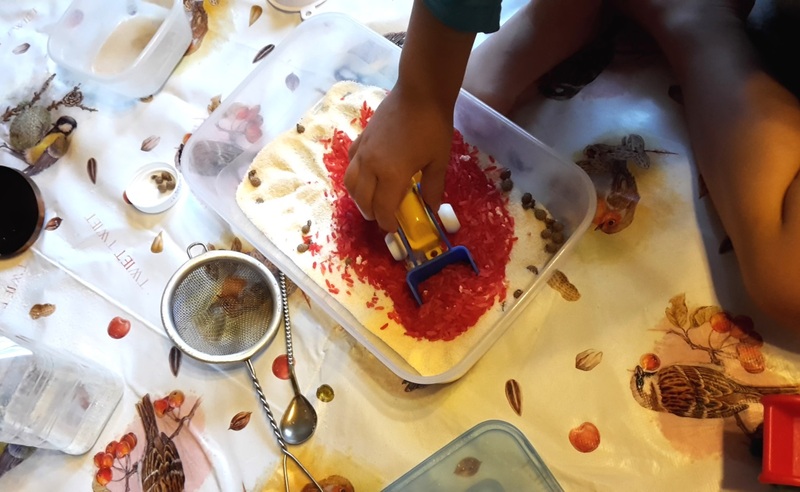 For example when we can’t play outdoors as much as kids would like, because parents have to start cooking dinner. 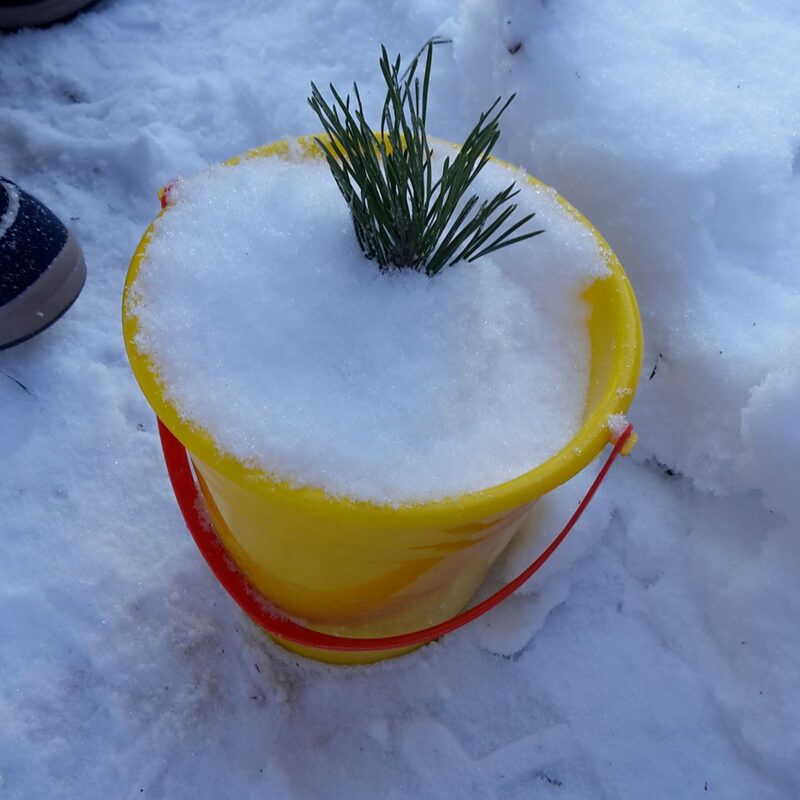 Then we put snow in kids’ bucket and bring it inside. 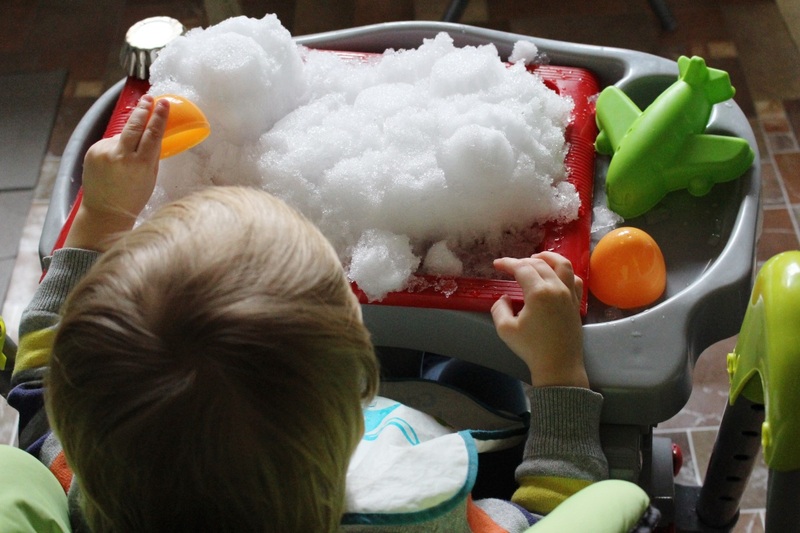 Or just take the snow from a window sill. 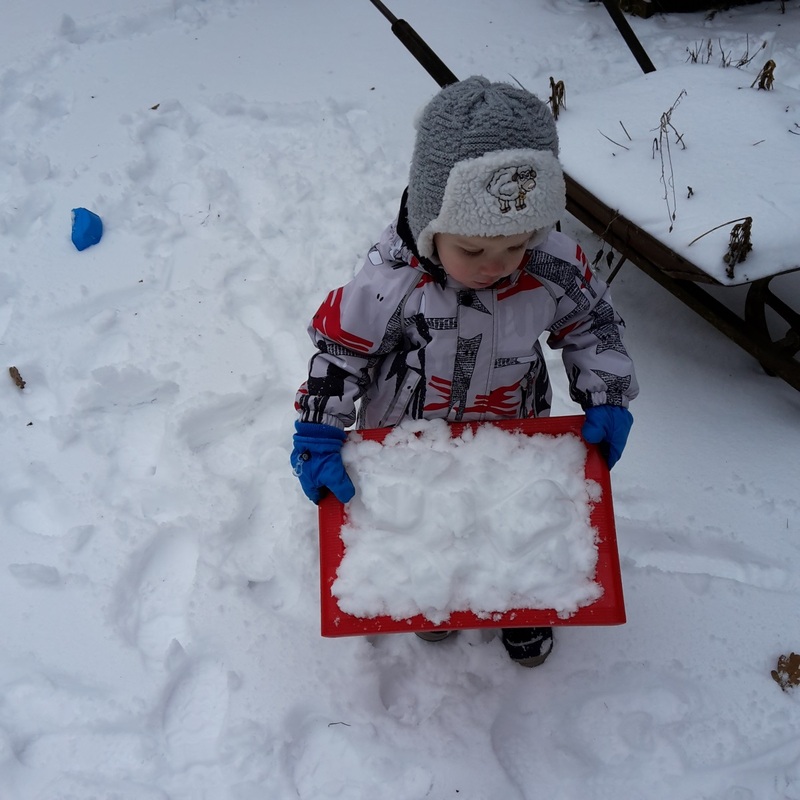 …on a first try I offered to paint the snow. It was interesting, but I had to keep an eye all the time so Toms wouldn’t eat that colorful snow or put it in his eyes. 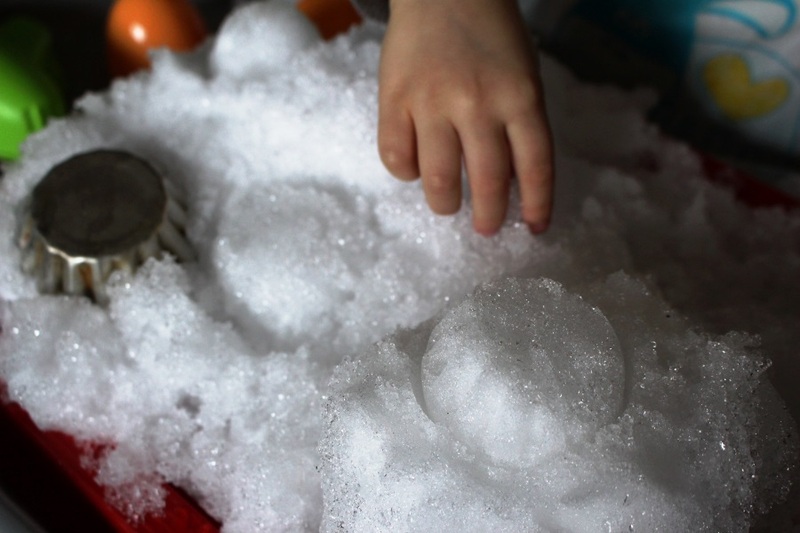 …starting with a second time I just give different containers to make snow cakes. The day when we made a snowman outdoors earlier, Toms made second snowman on a tray. I just helped with eyes, nose and smile. Without colors it was even more interesting and I could let him eat a bit of snow without a worry. 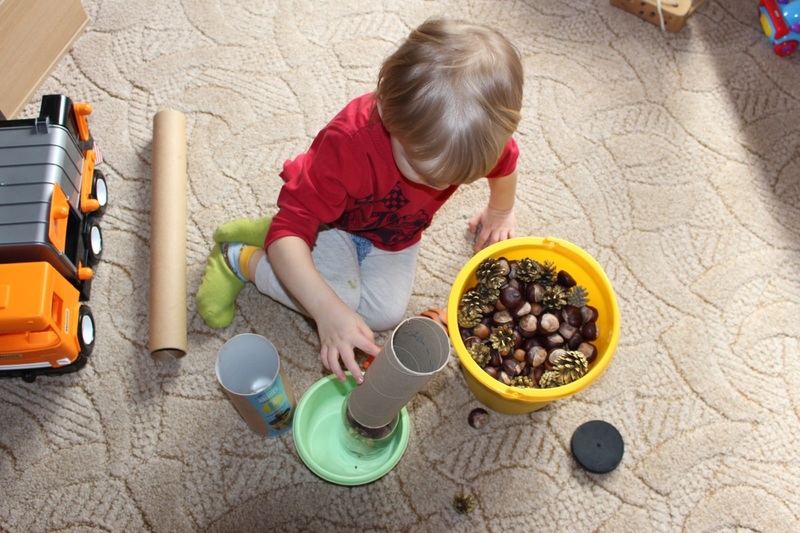 We have chestnuts in our home since Toms was 1 and he played with putting them in a plastic bottle. 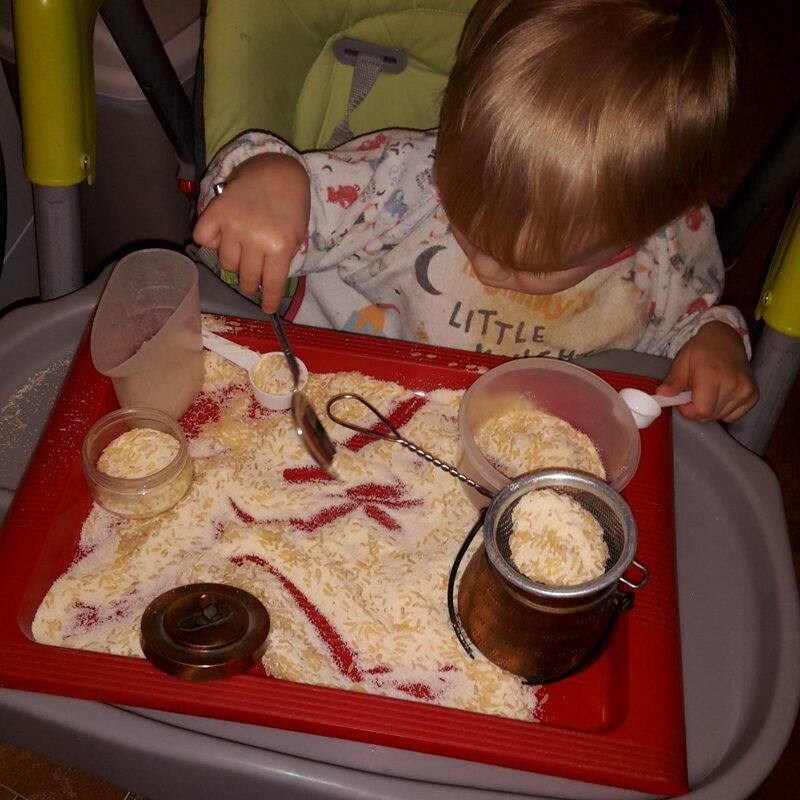 That is what we asked him to do, but of course pouring them out on the floor was much more fun! 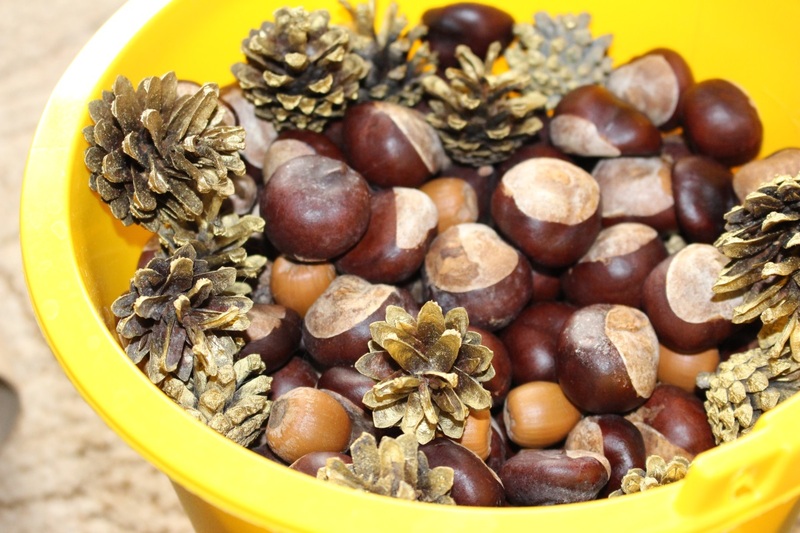 I have to admit that using chestnuts this activity isn’t quiet at all, but since I don’t have cotton balls at home yet, we played with what we had. 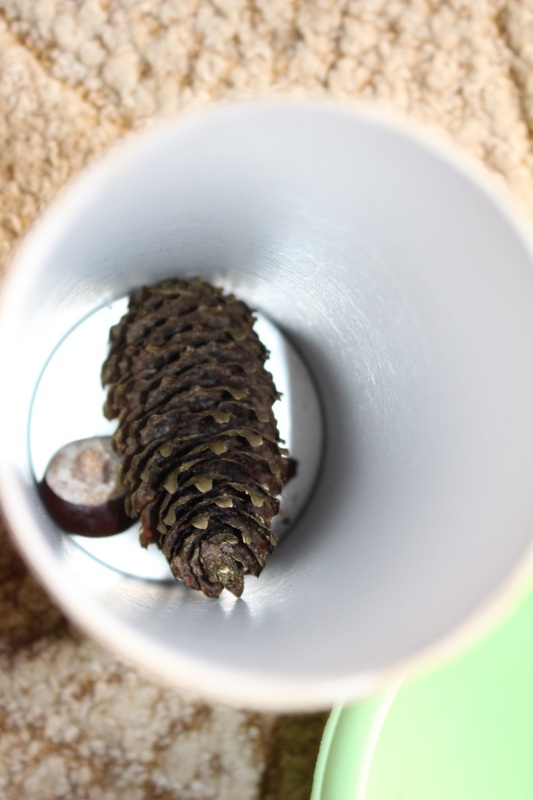 You need one or few tubes – I had cardboard tubes from wrapping paper and plotter paper on hand, so I used them, but you can use plastic tubes from construction store. 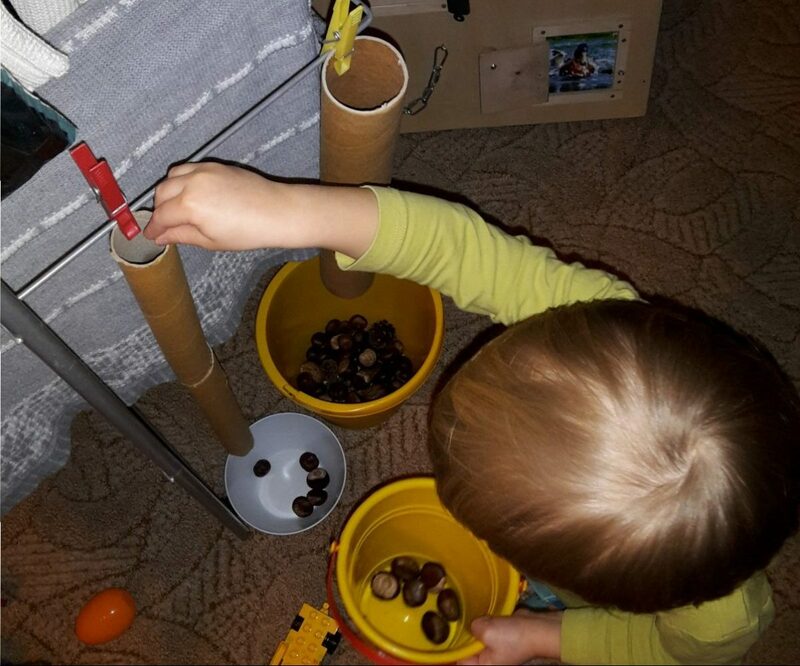 Tubes can be attached to wall with tape, but I tried it the fast way – pinned with pegs to dryer stand. 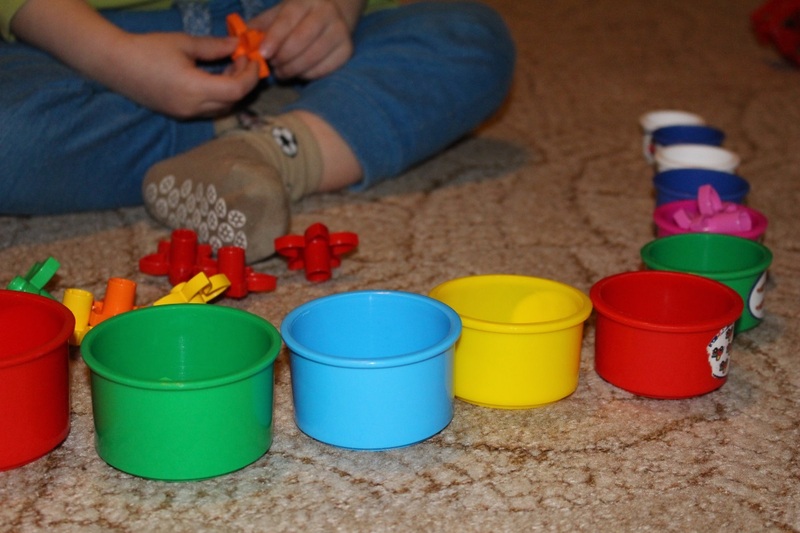 Put buckets or bowls below (if you have colorful cotton balls, you can use bowls in different colors and motivate your kid to throw balls by colors). 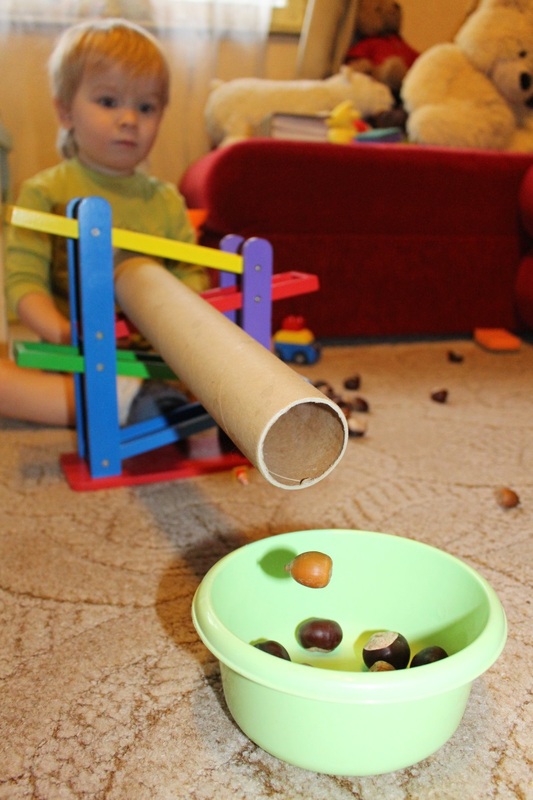 Sometimes Toms invents new ways to play with these materials, for example, pour chestnuts in his garbage truck through a long tube. 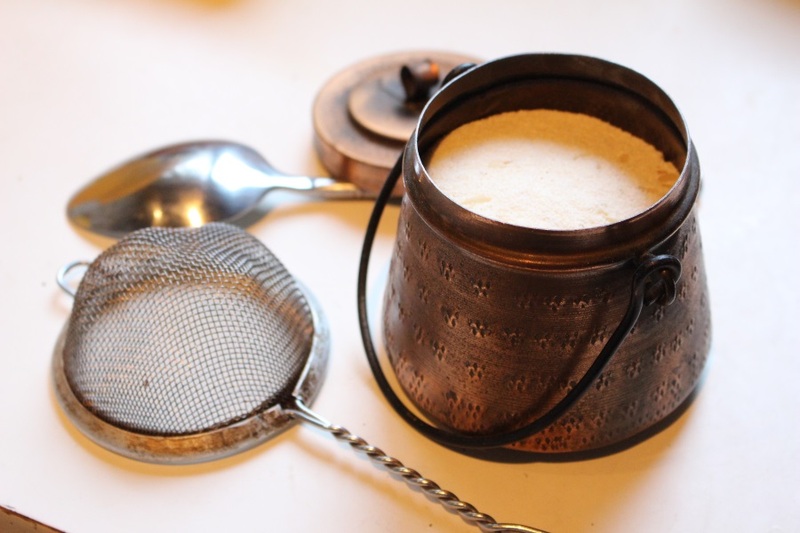 On Latvian moms Karīna blog I found easy activity, that Toms liked a lot. 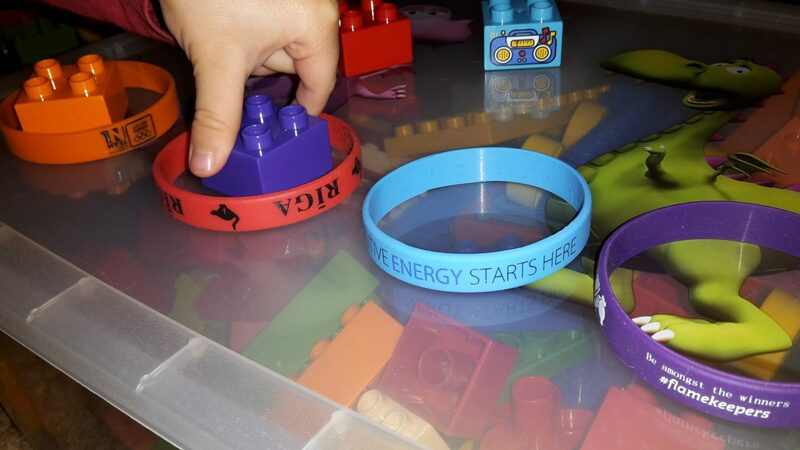 Colorful rubber bracelets and bricks in the same colors. 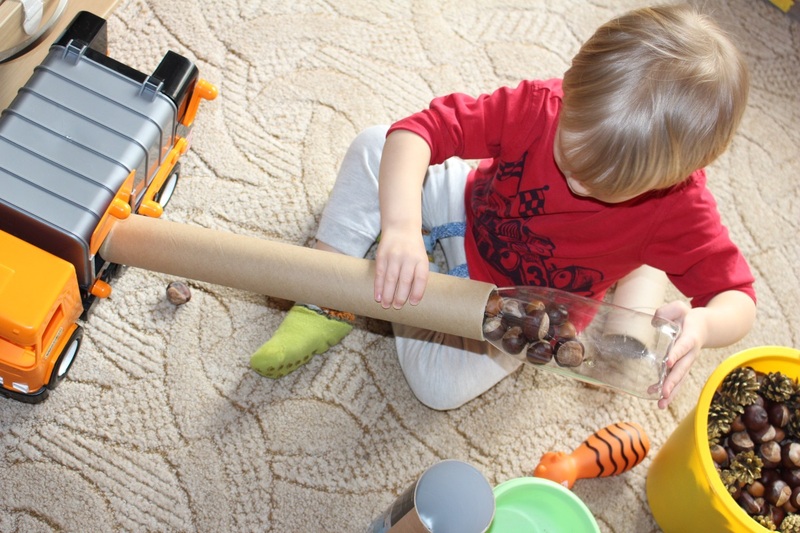 This activity is easy so it won’t work for more than 10-15 minutes, but if kid likes it, then it is great! More colors, more interesting of course! 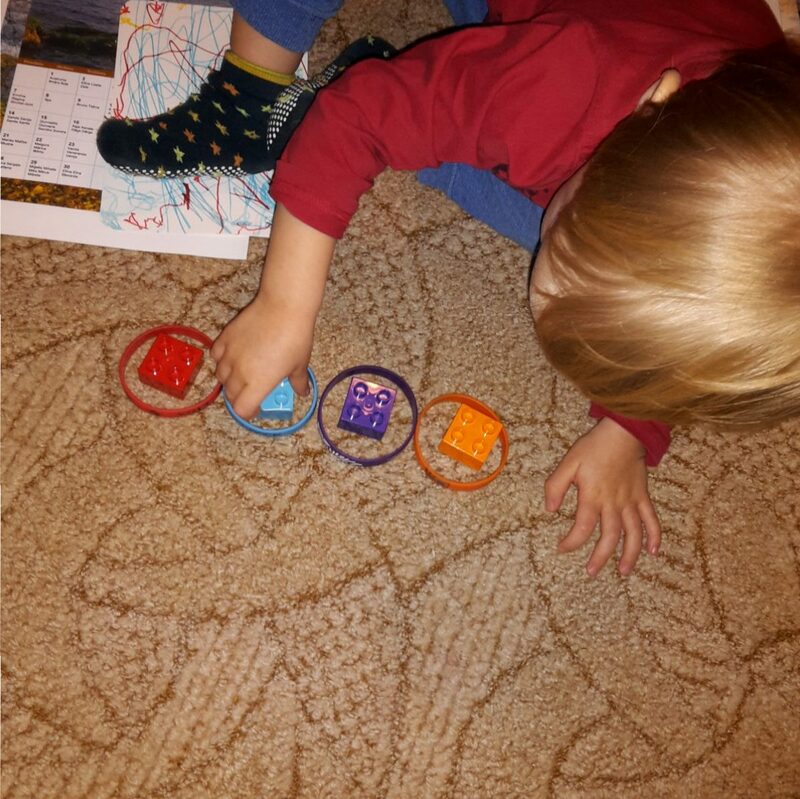 Before I red about bracelets, time after time I offered color sorting tasks since Toms was very little to understand, when he is ready for color activities. One of my favorites was cups from a pyramid and Lego flowers (it could be anything, but I like to choose objects with a same form so only color would define them). When I found an activity with plastic bottle and fabric ribbons, I thought Toms would like it a lot. False! He gave it away after 2 minutes. Maybe it wasn’t the right time and place and I think I will try it again after some time, but I am sure some other kid could enjoy it! 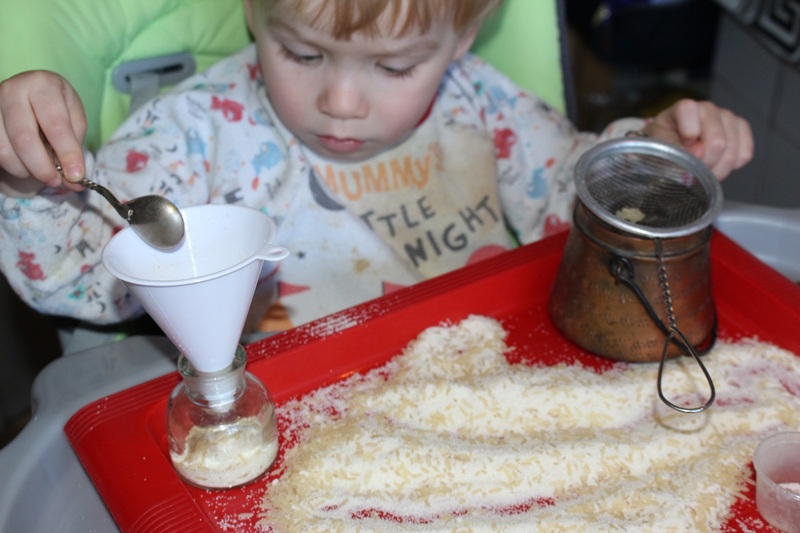 We are engaged in most quiet activities in the kitchen, because many of them are connected with risk of getting dirty or pouring part of semolina on the flour, but also puzzle activities interests longer without many colorful other toys laying around. If you have home office, then it would be good place for cleaner quiet activities and it would help with learning that work and studying has its own time, place and form (sitting nicely by the table).